The latest book in our Library of Pauline Studies series, Paul and the Jews examines the question, How did Pauls thinking compare with that of the Jews of his time? By providing a survey of the scholarly views on this question, Andrew Das offers the beginning Pauline student an entrance into the interesting world of Pauline studies and then presents his own conclusions to this pivotal question. - Publisher Paul and the Jews examines the question, "How did Paul's thinking compare with that of the Jews of his time?" By providing a survey of the scholarly views on this question, Das offers the beginning Pauline student an entrance into the interesting world of Pauline studies and then presents his own conclusions to this pivotal question. 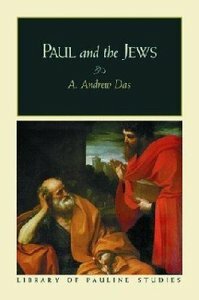 About "Paul and the Jews (Library Of Pauline Studies Series)"
Paul and the Jews examines the question, "How did Paul's thinking compare with that of the Jews of his time?" By providing a survey of the scholarly views on this question, Das offers the beginning Pauline student an entrance into the interesting world of Pauline studies and then presents his own conclusions to this pivotal question. Das earned his Ph.D. from Union Theological Seminary in Virginia. He is Assistant Professor of Theology and Religion at Elmhurst College in Illinois.